A method to provide air conditioning to buildings by taking advantage of an available cold water source (usually deep cold water from a lake or ocean). reduction in fresh water use compared to conventional A/C systems. Resorts, residential complexes, commercial buildings or other institutions that have access to a large quantity of cold water. Deep sea/lake water air conditioning is technically and economically feasible today. An AC powered compressor compresses gas resulting in the generation of heat. The gas (shown as red in the figure) runs through a set of coils for heat dissipation and condenses into a liquid. The liquid passes through an expansion valve quickly evaporating into cold low-pressure gas. The cold gas (shown as blue in the figure) runs through a set of coils for heat absorption cooling down the air inside a building. Large commercial buildings use the expansion of the refrigerant gas to cool water instead of cooling the air directly (called a chiller unit). Chilled water is then pumped throughout the building to provide air conditioning. Furthermore, large systems utilize cooling towers to more efficiently cool the high-pressure side of the system (shown as red in the figure above and the top part of the figure to the left). All of these components, compressors, water pumps and cooling towers, contribute to the high operating expense of conventional AC systems. Along many ocean coastlines and lake shorelines, there is reasonable access to naturally cold water that is as cold or colder than the water used in conventional air conditioning systems. If this water can be tapped, then the significant power for operating mechanical chillers can be eliminated. The process is very similar to using chillers in conventional AC systems. The only difference is that the cold temperature is not achieved by evaporation of a liquid into a gas. Rather, it is retrieved from a natural cold water source – from a deep ocean or lake. Water is pumped from a deep cold water source (ocean or lake). The water is passed through a heat exchanger. A closed-loop fresh water distribution system is pumped through the heat exchanger cooling the water. The cooled water is distributed to buildings for air conditioning. There exist three main components of deep water cooling. These basic components can be optimized for each specific location, climate and building. A sea/lake water open loop supply system which pumps deep cold water through a heat exchanger and returns the warm water through a shallow outfall (note that in Enwave’s design the water is not returned to the lake but used for the city’s water supply). A fresh water closed loop system pumps warm water through the cooling station heat exchanger and distributes the cooled water among commercial, residential and institutions for air conditioning. A heat exchanger (cooling station) transfers heat from the fresh water distribution loop resulting in cold water for air conditioning purposes. In some cases, it may be either too costly or impractical to supply seawater at the necessary low temperatures to maintain minimum temperatures in the chilled water loop. The distance offshore to reach sufficiently cold water might be prohibitive or the ocean depth may simply not be available. It is sometimes economically possible to use auxiliary chillers to supplement the cooling provided by the seawater exposure. This is illustrated to the left. The fresh chilled water is first cooled by seawater through a heat exchanger and then secondarily cooled with an auxiliary chiller. The auxiliary chiller is basically a refrigeration system with its condenser cooled by the returning flow of cool seawater. With the condenser kept cool, the auxiliary chiller can operate at an extremely high efficiency – as high as double that of a conventional chiller. A SWAC system has a high capital cost and a low operating cost. The peak capacity of the system must match the peak demand of the buildings that it serves. These demands are not constant throughout the day or throughout the year, and the total system is frequently not being used to its maximum capacity. Therefore, capital dollars are spent on a system that may not always be used to its maximum potential. A means of minimizing the capital cost is to use cold-water storage. The seawater air conditioning system would be operated 100 percent of the time and when the building demands are low, the excess capacity is directed into a storage system of cold fresh water. When A/C demand is at its peak, the cold water is drained from its storage to meet the demand. Cold water storage tanks are commercially available that are constant volume; the warm water remains at the top and the coldest water remains at the bottom. These tanks are now used in conjunction with conventional A/C systems to take advantage of low, off-peak electrical rates. The existence of the deep water ocean heat sink results from natural climatic processes where water is cooled at the poles, becomes dense and sinks to deeper water. The graph above illustrates a temperature profile in the tropics typical for the world’s deep oceans: 7°C or colder can be reached at 700m depth, 5°C or colder at 1000m. The deep-water portion of this profile changes little seasonally and therefore cold water is available on a year-round basis. There are significant secondary applications for this seawater. Secondary cooling, aquaculture, desalination and even agriculture can benefit from the cold seawater. Aquaculturists value the water because it is clean and disease free. When used in conjunction with a warm source of water, they can have any temperature seawater their product needs. Secondary cooling can be used in greenhouses and other locations where humidity control is not a major factor. Finally, research in Hawaii has shown that even an arid land can be made highly productive with low fresh water consumption by cooling the soil and the roots (resulting in condensation) of many tropical and non-tropical plants. Deep seawater is also desalinated and sold as a premium drinking water. 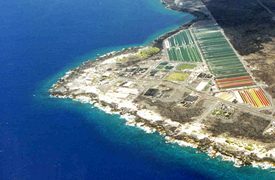 The figure to the left is an aerial photo of the Natural Energy Laboratory of Hawaii Authority (NELHA) where many of these secondary applications are being used and researched. The distance offshore to cold water: shorter pipelines are more economical than long pipelines. The size of the air conditioning load: there is an economy of scale associated with SWAC – systems less than 1000 tons are more difficult to justify economically. The percent utilization of the air conditioning system: The higher the utilization throughout the year, the higher the direct benefits. The local cost of electricity: A high cost of electricity makes conventional AC more costly and SWAC, in comparison, more attractive. Any cost analysis should include current and future costs of electricity. The complexity of the distribution system on shore: SWAC works best with a district cooling arrangement, where many buildings are cooled taking advantage of the economy of scale. SWAC is even more economical if this distribution system is compact. The figure to the right illustrates the difference in lifetime costs for a conventional AC system and a typical SWAC system. The costs are broken down into capital, operating (energy) and maintenance. The primary cost of a SWAC system is in the initial capital cost. The operating and maintenance costs are small. For a conventional AC system, the primary cost is in the power consumed over its lifetime. Hence, SWAC systems are ideal for base load AC that has high utilization and conventional AC may be better for situations of infrequent use. It’s important to note that there is a dramatic economy of scale as the size of the pipeline increases. The reason is that the cold water pipe costs per liter of water delivered decreases as the pipeline size increases and temperature rise via large pipelines is practically negligible. The figure to the left illustrates five SWAC scenarios of varying overall size; the two bars compare the life time cost difference between conventional AC and SWAC. SWAC feasibility studies for a variety of sites indicate that electrical consumption is typcially reduced by 80 to 90 percent. Simple payback can be from three to seven years, and long term costs can be half that of a conventional air conditioning system. Not all locations, however, are ideal. Some have poor access to deep cold-water sources or the overall size is too small to be economical. Cornell Lake Source Cooling Project contains a great deal of information regarding deep lake water air conditioning. Environmental News Service Aug. 1999 Article: Seawater Irrigates Crops, Cools Buildings. enwave’s Deep Lake Water Cooling System contains general information about Toronto’s deep lake water cooling system. Geotimes July 2002 Article: Lake Creates Natural Air Conditioner. Makai is the leading provider of SWAC engineering services and has completed numerous feasibility, preliminary design, final design and construction management services for SWAC projects. Natural Energy Laboratory of Hawaii Authority (NELHA) has research and educational programs centered around their deep seawater supply systems. Ocean Resources 2000 Article: Air Conditioning with Deep Seawater: A Cost-Effective Alternative. Honolulu Star Bulletin Oct. 2003 Article: Med School Plan utilizes sea water in air conditioning. Honolulu Star Bulletin Dec. 2004 Article: Cold Water Air Conditioning Project Merits Warm Reception.